Cholpon-Ata is resort town in the Issyk-Kul region, located 265 km from Bishkek. Its main attractions are the mountain ranges of the Ala-Too and Issyk-KulLake. Here you can also see different petroglyphs and burial mounds. Cholpon-Ata petroglyphs are located between the northern, western and north-western outskirts of Cholpon-Ata. The drawings theme is varied but the main pictures are the images of animals: deer, bulls, horses, wild rams, goats, wolves and many others. There are also the scenes of animals attack, riders on horseback and many images of people. Most petroglyphs of Cholpon-Ata are dated to II millennium BC - VIII millennium AD. It is important to note that the petroglyphs of Cholpon-Ata and the whole Issyk-Kul region include ancient tombs, helping to point the exact date of petroglyphs and its first ethno-cultural identity. 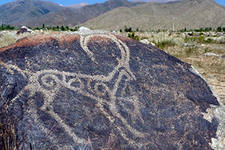 Cholpon-Ata Petroglyphs are the place where local people conducted religious rites, elated to the spiritual world of the nomadic population of Issyk-Kul. Cholpon-Ata petrogliphs are famous not only among the people of Kyrgyzstan, but also in neighboring countries.